Below is a little chart I put together looking at the more modern-day continuationist views. Of course, contrary to some views, church history is full of individuals and groups that testify of the activity of God’s Spirit in revelations, visions, prophecies, healings, miracles, etc. But this below mainly looks at the more recent moves of the past 110 years – from Pentecostalism to charismatics to neo-charismatics. 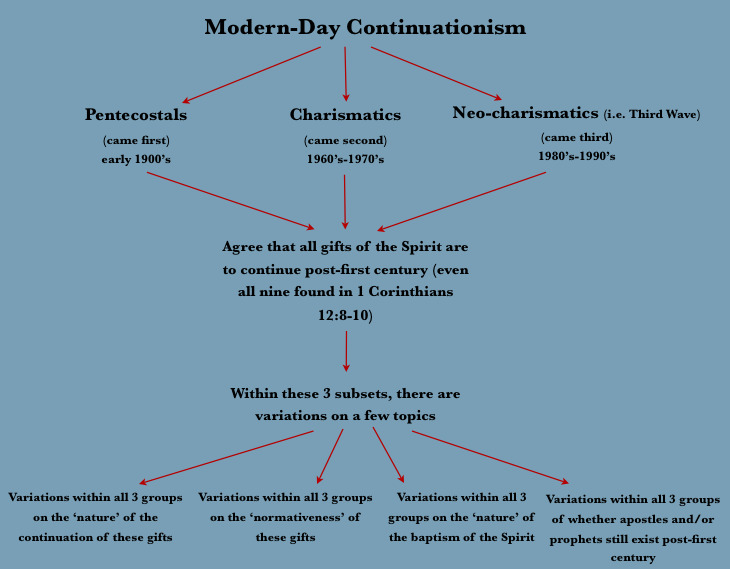 This entry was posted in charts, continuationism, Gifts, Gifts of the Spirit, Holy Spirit and tagged charts, continuationism, Gifts, Gifts of the Spirit, Holy Spirit, spiritual gifts. Bookmark the permalink.